Heather Mitchell says: oh YESSSSSSSSSSSSSSSSSSSSSS	~ Reply? Heather Mitchell says: Jenny you just made my day with this one	~ Reply? Afke says: I lol'd. XD	~ Reply? Mayumi Ogihara says: LOL! You are so good, Jenny! I just love the expressions on their faces, lol!!!!! ~ Reply? Sylvia Heidewald says: Hee hee, that is great. Love the expressions. ~ Reply? Jenny Heidewald replied to this: Thanks Mom! :) It is interesting all the different expressions Glen Keene made for those two, they make the features very flexible for quite a range of expressions. katerina Koukiotis says: jenny i remember the line and scene love this!!! 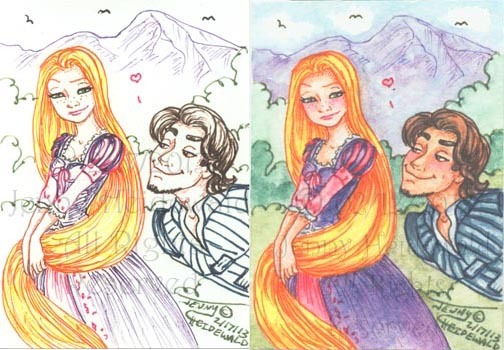 his smoulder didnt do much for rapunzel..lol..	~ Reply? Anon says: This is so cool! Well done Jenny.X	~ Reply? Jenny Heidewald replied to this: :D Thank you Lisa! Sarah Alden says: Awww haha love it!!! ~ Reply?